This is an awesome hotel. The rooms are clean and the pool is beautiful. 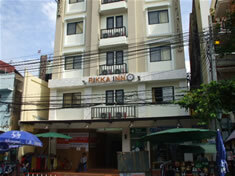 It is directly on Ko San road which is so easy. The desk ladies were so very friendly. I am most certainly going to stay there where I go back to Bkk. And the price was so cheap for what it was.